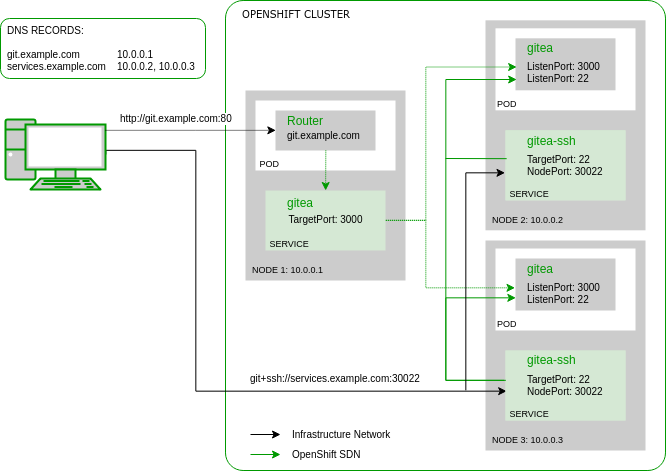 The OpenShift community produces a lot of interesting tutorials about how to try new solutions and configurations but unfortunately they are mostly based on a minimal setup such as MiniShift, which is definitely a cool gimmick, but badly resembles a real cluster setup. Often those posts only concentrate on the known good path about how something is supposed to function in the best case. They rarely mention how it could be debugged or fixed if it doesn’t work as expected. As all of us know, the more complex a system is, the more can go wrong and this technology is no exception especially when run in a real distributed setup. To give you some insight in how such procedures can go wrong, I’d like to share the experience I made when I tried to update my multi-master/multi-node OKD cluster. As an experienced Linux engineer or developer you might think that version updates are nothing special or exciting, but this experience will disabuse you. I hit many issues and here is how I did it. IMPORTANT: This is not a guide how to upgrade OpenShift. It’s only a field report which is missing a lot of technical details for a successful upgrade. Please always investigate the official documentation. At home I run a small OKD cluster consisting of three masters, each also hosting a etcd member, and four nodes, of which there are two infrastructure nodes, hosting the routers and registry, and two compute nodes, hosting the applications. I feel that’s the minimal setup required to resemble a production-like cluster. To make the setup a bit more interesting the persistent storage is served by a container-native storage (CNS) configuration were three GlusterFS pods are distributed on the masters. This definitely deviates from how a production cluster should be setup, but as I’m running this locally at home, I don’t have enough resources available for separate storage nodes. My masters and nodes are running atop of CentOS Atomic Host which I updated to the latest 7.1811 release just a few days ago. As identity provider for OpenShift I’m using a FreeIPA server on a separate CentOS box. Since I installed this cluster with OpenShift Origin 3.9 five months ago, it was running stable and I had a lot of fun with it. After the recently published security advisories time has come to finally take a chance to upgrade OpenShift. The first thing, you should always do before starting an OpenShift update, is to carefully read the release notes. I explicitly linked the Red Hat OpenShift Container Platform (OCP) release notes here, because OKD unfortunately doesn’t nicely touch up theirs. For the initial release update they are mostly congruent. Make sure to study it carefully, as this might be the primary source of information once something starts going down. For the 3.10 update, an important information is the new handling of the containerized master controller and API services. Eventually we now have a basic idea about what to expect. It would be nice, if there was a fool-proof command to run the update and it seems that OpenShift 4 with its Cluster Version Operator is heading there. But until then we need to carefully study and follow the official OKD 3.10 Upgrade Guide. It’s important to get the documentation for the correct release because the involved adjustments to the Ansible inventory are different from release to release. For those not knowing how OpenShift 3.x release upgrades work, it’s done via Ansible playbooks which are using the same inventory (definition on how everything will be configured) as the initial OpenShift cluster installation. Note that although the openshift_node_labels variable is no longer effective, no labels will be removed during the upgrade. So if you don’t get the label definition right at the beginning you don’t have to worry that after an in-place upgrade some workload is suddenly not scheduled anymore. I had some custom openshift_node_kubelet_args defined in my OpenShift 3.9 inventory but this variable is also not respected any longer. With 3.10 the correct way to customize the node configuration is to define a edits argument in the corresponding node group definition, which is then applied to a ConfigMap resource by the custom yedit Ansible module. While writing such a definition itself is already not super intuitive, it can only be done by re-defining the entire openshift_node_groups variable, possibly also blowing up every other node group definition if done wrong. For the moment, I chose to drop my custom node configuration entirely to make the inventory less error prone for now. Before running the upgrade playbooks it’s also important that every manual configuration update done in the past (e.g. in the master-config.yml) has to be reflected somewhere in the Ansible inventory. Otherwise the change might be lost after the upgrade. In my setup I still had to add the LDAP authenticator to the openshift_master_identity_providers variable because I added it manually after the initial cluster installation. The section about Special Considerations When Using Containerized GlusterFS gave me a bit of a bad feeling as my GlusterFS pods are running on the control-plane hosts. But it’s not an easy task to change that now, so I chose to still go on with the upgrade and hope for a work-around in case something should break. Now using project "glusterfs" on server "https://openshift.example.com:8443". According to my experience it can happen that sometimes a brick displays a N in the Online column which means that the corresponding brick process wasn’t started successfully. If multiple bricks of the same volume are down, your entire volume is down and must be properly recovered. In such a case don’t continue with the steps below! The pod will be automatically restarted and the brick processes should come up this time. Didn’t it just said, that all the GlusterFS volumes are healthy? What the heck is "cluster_name": "registry" and what is it doing with GlusterFS in the ‘default’ namespace anyway? With the updated inventory I started the control-plane upgrade playbook once more. This time it ran for quite a while and even started to do some real stuff. It replaced the docker run command in the ‘origin-node’ systemd service with a runc command using the 3.10 image. Finally some progress. But eventually another error aborted the playbook and again it was a totally unexpected one. rpc error: code = 2 desc = oci runtime error: exec failed: container_linux.go:247: starting container process caused "process_linux.go:110: decoding init error from pipe caused \"read parent: connection reset by peer\""
But the latter one was behaving weird. Sometimes it hung although the API services of the two other nodes were still up. There is definitely something wrong. When checking the logs locally, I saw an error that my FreeIPA CA certificate which should be used to validate the LDAPS connections cannot be found. That’s strange. I explicitly configured the ca key in the openshift_master_identity_providers variable pointing it to the correct CA certificate. I did this in other OpenShift cluster inventories before and there it was working… But those were not running OpenShift 3.10 or later. With 3.10 the playbook developers removed the possibility to custom-name the CA certificate so the ca key from the inventory was silently ignored. Only after checking the installation instructions regarding Configuring identity providers with Ansible, I found an inconspicuous comment that the CA certificate destination path now follows a given naming convention. When I was adding the identity provider configuration to the inventory before the update, I didn’t specify the openshift_master_openid_ca or openshift_master_openid_ca_file variables which will ensure that the CA certificate is copied to the correct place. After all the certificates were already on the master hosts and the identity provider was working, so I didn’t want the upgrade playbook to touch the certificate. Now that’s the result: My mistake. Still, I like issues that are clear and can be fixed so easily. A quick rename of the certificate on the master hosts made the API service successfully start again. All API servers are running again, although only the first one in the final configuration, but the oc command invocation still feel sluggish. Sometimes it even hangs completely. When checking the process list it attracted my attention that the etcd processes are only a few minutes old and sometimes they are not running at all. So I was checking the etcd cluster health and here it is: Two cluster members are down and one is in the state unhealthy. That is bad… Immediately, I started manually triggering etcd restarts. But only a few minutes later they shutdown again. I was checking the log files and there were errors, but I couldn’t figure out a single reason what might cause this mess. Then I found that the /etc/etcd/etcd.conf was updated during the playbook run, so I restored the backup, but again it wouldn’t fix the issue. Eventually I started to accept the thought that I might need to completely restore the etcd database from a backup because the database might already be so corrupt in the mean time that it is not able to find a stable state anymore. Ouch! Now I understand why the pods keep restarting. It’s again the same error that also caused the etcd backup failure before. But now I’m using the new quay.io/coreos/etcd:v3.2.22 image. This disproved my theory that a buggy image might be the reason. For the moment, I ran out of ideas… Until I remembered that I recently read a post about a docker bug (#1655214) that affected CentOS 7. Thanks for that! After checking the docker version on Atomic host 7.1811 (docker-1.13.1-84.git07f3374.el7.centos) it’s confirmed. That’s the root cause for so much trouble so far. I didn’t need to dig too much into Atomic Host so far, as most of the stuff was simply working or was easily fixed with an update in the past. But this time it didn’t look that there is an imminent update. Release 7.1811 was only a few days old. I could roll back, but the previous version is 7.1808. That’s three months back and somehow defeats the purpose of my update, to get the latest security fixes. Fortunately CentOS already released new docker packages where this bug is fixed. Now I just need to find a way to update the docker packages independently from the ostree image? This time the documentation gods were on my side. I quickly found Dusty Mabe’s Atomic Host 101 Lab Part 4: Package Layering, Experimental Features. I carefully did this on one master server after the other and surprisingly all the services (except etcd) were started normally. Even my GlusterFS pods came up again as nothing had happened. But still, the etcd cluster was offline and with it the Master API was inaccessible. No oc commands were possible. Make sure that all the etcd processes are down and not coming up again automatically. On an OpenShift 3.10 cluster, you prevent automatic startup by moving the /etc/origin/node/pod/etcd.yaml definition to a backup location e.g. /etc/origin/node/pod/disabled/ on every etcd host. If everything is ready to start the etcd process, move the altered etcd.yaml file back to the /etc/origin/node/pod directory. Within a few moments, the pod should startup and create a new cluster. If it comes up again and shows healthy, we can continue the add the other two cluster members. The new member will then be displayed as ‘unstarted’ in the member list. Prepare the /etc/etcd/etcd.conf file on the new etcd host by defining the variables as shown in the output of the etcdctl2 member add command above. The ETCD_INITIAL_CLUSTER value will automatically be extended with each new member added to the cluster. Enable the etcd pod by moving the etcd.yaml back to /etc/origin/node/pod. Within a few minutes the etcd process should be started and eventually join the etcd cluster. During the entire time the etcd cluster was down the OpenShift cluster continued running. The registry, routers and applications such as my Gitea setup were online all the time and even the CNS cluster running on the master hosts handled the debugging and restart session with bravery. Fortunately I had a super static setup during that time and so no deployments or replica count enforcement needed to be executed which would have been impossible anyway. Still I feel it’s a positive fact that shows the resiliency the platform has gained over time. After a longer detour, I was finally back at the point were I could start another run of the control plane upgrade playbook. Remember, when the playbook aborted before it did so after upgrading the control plane services on the first master node, there are still two to go. So I started the playbook once again. By now I have a really good feeling about the state of the playbook in this release. As you can see above, it failed on me many times in all different stages of the update, but it always had a good reason and it was always able to pick up where it left. My experience with initial upgrade attempts of earlier OpenShift releases was unfortunately not always that good. For example it happened to me that I had to restore a master host from a snapshot, because the playbook failed to correctly detect the upgrade state in the second run, after it aborted the first run due to a syntax error in a post-upgrade task. After the control-plane was done, I had to upgrade the infrastructure and compute nodes. A separate playbook placed at playbooks/byo/openshift-cluster/upgrades/v3_10/upgrade_nodes.yml is available. Initially I only wanted to run it on a single node to make sure everything works as expected. This can be done by passing the -e openshift_upgrade_nodes_label=kubernetes.io/hostname=node03.example.com argument, where the given host name is obviously the node that should be upgraded, to the playbook execution command. The playbook completed without error already on the first attempt. So I continued with the other nodes. One fact is super important when upgrading the nodes to OpenShift 3.10. The /etc/origin/node/node-config.yaml is completely regenerated based on the settings in the corresponding node group (and/or the defaults) and so any prior adjustment not reflected in the inventory is lost. Therefore make sure that you perfectly understand the Node Group concept and how it affects your node layout and configuration. To give you an example how to customize the upgrade behavior on the infrastructure nodes, I added the following arguments to the playbook execution: -e openshift_upgrade_nodes_label=region=infra -e openshift_upgrade_nodes_serial=50%. NodeSelectors can also be set in DaemonSets, as annotations in projects or even globally via master-config.yaml. Therefore make sure to update them all, when required, before removing any labels from the nodes. This was not my first OpenShift update ever, but my first update from 3.9 to 3.10. This obviously means that I made some mistakes and had wrong assumptions from which I did learn a lot. I hope I could share some insights and useful hints for those of you that haven’t done this before. Otherwise it will at least help me in the future to run this update an other cluster much smoother. You need to have a test cluster where you can practice such updates. It doesn’t need to be big but the Ansible inventory variables should be structurally as similar as possible to those of the production cluster. As you saw above, a lot of errors just happened due to wrong inventory variables. Ideally the test cluster should have some workload so that you experience how the applications behave during the update and and so that you can test if everything still works after an upgrade. Emphasis your Ansible inventory. Everything of your configuration that can fit into the Ansible inventory must be defined there and must be maintained there. It can cost you a lot of time debugging or even result in application downtime during an upgrade if you manually updated the cluster configuration without adjusting the configuration in the inventory. Even when it sometimes feels like it’s more work than benefit it’s always worth it. Preparation is key. Carefully read through the upstream documentation available. Most likely you also have some internal documentation where your infrastructure specifics are written down. Run the upgrade on a test cluster before you do it in production. If it doesn’t work on the first attempt, update your notes and try it again. Try to gain as much experience as possible on the test infrastructure so that you already know what to do if something goes wrong in production. Plan a lot of time. Doing such an upgrade is a lot of work! Give yourself enough time to do a proper preparation and also the actual upgrade window itself should give you enough time to fix issues when they arise. Plan in the scale of hours or better days. Ansible is slow. If you have to restart the playbook because of an error after 15 minutes this will eat up your time fast. Thanks for reading. As always I’d welcome some feedback or critics in the comments. The first thing that someone would need when operating or playing around with OKD (better known as OpenShift) is a git version control service. Personally I’m a fan of Gitea and that’s why I’d like to show a way how to run Gitea in a OpenShift environment. Gitea upstream already provides a great container image which I’m are going to use. But as some of you may have already experienced, running an image on docker and running it in OpenShift is two different pairs of shoes. The fact that the Gitea image runs an integrated SSH server means that it doesn’t simply match the widely discussed Web application pattern. Therefore I’m trying to explain some of the difficulties that one might encounter when moving such an application to OpenShift. In OpenShift the Kubernetes Service resource is responsible for directing the traffic (TCP, UDP or SCTP) to the individual application pods. It maps the service name (e.g. ‘gitea’) via SkyDNS to a so-called ClusterIP. This is a virtual IP address that is not assigned to any host or container network interface but still used as packet destination within the cluster SDN (software defined network). After receiving a packet to this so-called ClusterIP the Linux kernel of an OpenShift node rewrites the packet destination to an IP address of an actual application pod and acts as a virtual network load-balancer. Hi there, You've successfully authenticated, but Gitea does not provide shell access. If this is unexpected, please log in with password and setup Gitea under another user. The NodePort mechanism is allocating the corresponding port on each OpenShift node. To avoid a clash with node services such as the DNS resolver or the OpenShift node service the port range is restricted. It can be configured in the /etc/origin/master/master-config.yml with the option servicesNodePortRange and defaults to 30000-32767. Obviously multiple applications in the same cluster cannot use the same port and traffic to the chosen port must be allowed by the host firewall on the OpenShift nodes. NodePorts are always allocated on every OpenShift cluster host running the node service which also includes the OpenShift master servers. OpenShift doesn’t provide a way to restrict the involved hosts to a subset. In my example I choose to restrict the hosts receiving traffic by only adding a limited number of nodes to the service DNS entry and block access on the others via iptables. If you don’t use an application load-balancer in front of the OpenShift routers you could also re-use the wildcard DNS entry defined for the HTTP traffic. The NodePort traffic would then follow the same path as the normal Web traffic. If one OpenShift node goes down a client trying to access the Gitea SSH service might still try to connect to the unreachable host. Fortunately, the default SSH implementation used by the git command line client is quite tolerant and simply retries with another IP address. When testing this case I therefore haven’t experienced a major issue except a slight connection delay. The failure behavior might be different for other git clients or other application protocols altogether and is definitely not ideal but simple instead. One way to improve this failure scenario would be to add a real TCP load-balancer in front of the NodePort but then there would be another piece of infrastructure that must be managed synchronously with the OpenShift infrastructure and which might be a new single point of failure. The Gitea image, and many other docker images not optimized for the pod concept introduced by Kubernetes, doesn’t start a single application process but a supervisor process (in this case s6) which then spawns multiple different application processes defined in /etc/s6. To do so it wants to create a FIFO in the /etc/s6/.s6-svscan directory which is only writable by the root user which fails as by default processes are started with a random unprivileged account. I’m not in favor of this approach as it “hides” the additional permissions in the default ServiceAccount and prone to break the principle of least privilege by assigning the SCC to potentially more applications than necessary. The dedicated ServiceAccount used in this approach already hints that there might be special privileges connected to it and is in my opinion easier to audit. The disadvantage however is the more complex configuration. Instead of adding every user account individually to the SCC a dedicated user group could be created having the SCC assigned to this group. Individual ServiceAcccountss would then be added to the group and therefore inherit the SCC. This would follow common practice in identity management to assign permissions to users via privilege groups. Additionally a group management role could be created which then would permit dedicated users not having the ‘cluster-admin’ privilege to manage the group membership. Unfortunately I couldn’t figure out a true self-service model where a responsible project admin could expand the necessary permissions without the possibility to interfere with other projects. In the documentation of OpenShift (<=3.7) I found a hint that it is/was(?) possible to extend the default ServiceAccounts available after creating a new project by adding the account name (e.g. ‘anyuid-service-account’) to the serviceAccountConfig.managedNames list in /etc/origin/master/master-config.yml. While this configuration is still present in newer master-config.yml, the documentation is gone and I also didn’t find a way how to automatically add a user created like this to the ‘anyuid’ SCC. Maybe it’s possible by somehow modifying the project template. If you have done this before or at least have an idea how this could be done, please drop me a line. At the end, the way how the ‘anyuid’ SCC is assigned to the Gitea application is unimportant as long as the application pod is allowed to start the s6 supervisor process with root permissions. The way how OpenShift administrators can provide an application setup ready for instantiation by OpenShift project owners is through Templates. Inspired by the My journey through Openshift blog post, I wanted to create my own Gitea template fixing some issues found in the original template and extending it with the opinionated configuration presented above. You can download it from here. The template is able to automatically setup Gitea with exception of the ‘anyuid’ SCC configuration. It requires a persistent volume (PV) for storing the git repositories and some static configurations such as the SSH authorized_keys file. By default it will use a SQLite database backend which is also stored in the PV. Optionally you can also give the connection string and credentials of a PostgreSQL or MariaDB backend which can run on OpenShift or externally. If you have some feedback regarding the template or troubles using it, please open a Github issue. Comments, corrections or general feedback to my article can be posted below. Thanks for reading. The recently disclosed Spectre and Meltdown CPU vulnerabilities are some of the most dramatic security issues in the recent computer history. Fortunately even six weeks after public disclosure sophisticated attacks exploiting these vulnerabilities are not yet common to observe. Fortunately, because the hard- and software vendors are still stuggling to provide appropriate fixes. If you happen to run a Linux system, an excellent tool for tracking your vulnerability as well as the already active mitigation strategies is the spectre-meltdown-checker script originally written and maintained by Stéphane Lesimple. Within the last month I set myself the target to bring this script to Fedora and EPEL so it can be easily consumed by the Fedora, CentOS and RHEL users. Today it finally happend that the spectre-meltdown-checker package was added to the EPEL repositories after it is already available in the Fedora stable repositories since one week. If your processor is affected by the different variants of the Spectre and Meltdown vulnerabilities. is known to cause stability issues. If your kernel implements the currently known mitigation strategies and if it was compiled with a compiler which is hardening it even more. And eventually if you’re (still) affected by some of the vulnerability variants. such as intempestive reboots or random crashes. the mitigations for Spectre), or upgrade to a newer one if available. "INFOS": "Mitigation: Full generic retpoline"
# spectre-meltdown-checker --batch nrpe 2>/dev/null ; echo $? I just mailed to Stéphane and he will soon release version 0.35 with many new features and fixes. As soon as it will be released I’ll submit a package update, so that you’re always up to date with the latest developments. Since a long time I’m using and following the development of the LXC (Linux Container) project. I feel that it unfortunately never really had the success it deserved and in the recent years new technologies such as Docker and rkt pretty much redefined the common understanding of a container according to their own terms. Nonetheless LXC still claims its niche as full Linux operating system container solution especially suited for persistent pet containers, an area where the new players on the market are still in the stage of figuring out how to implement this properly according to their concept. LXC development hasn’t stalled, quite the contrary, they extended the API with a HTTP REST interface (served via Linux Container Daemon, LXD), implemented support for container live-migration, added container image management and much more. This means that there are a lot of reasons why someone, including me, would want to use Linux containers and LXD. Please note that COPR packages are not reviewed by the Fedora package maintainers therefore you should only install packages where you trust the author. For this reason I also provide a Github repository with the RPM spec files, so that everyone could also build the RPMs on their own if they feel uncomfortable using the pre-built RPMs from the repository. lvl=warn msg="Error reading idmap" err="User \"root\" has no subuids." lvl=warn msg="Only privileged containers will be able to run"
Also for networking various options are available. If you ran lxd init, you may have already created a lxdbr0 network bridge. Otherwise I will show you how to manually create one in case you want a dedicated container bridge or attach LXD to an already existing bridge which would be configured through an external DHCP server. This will create a bridge device with the given name and also start-up a dedicated instance of dnsmasq which will act as DNS and DHCP server for the container network. The eth0 is the network device name which will be used inside the container. We could also add multiple network bridges or create multiple profiles (lxc profile create newprofile) with different network settings. I hope this short guide made you curious to try LXD on Fedora. I’m glad to hear some feedback via comments or Email if you find this guide or the my COPR repository useful or if you have some corrections or found some issues. Currently, I’m working on automating the setup of a authoritative DNS server, namely gdnsd. There are many nice features in gdnsd, but what might be interesting for you, that it requires the zone data to be in the regular RFC1035 compliant format. This is also true for bind, probably the most widely used DNS server, therefore the approach explained here, could be also used for bind. Again I wanted to use Ansible as automation framework, not only to setup and configure the service, but also to generate the DNS zone file. One reason for this is, because gdnsd doesn’t support zone transfers, therefore Ansible should be used as synchronization mechanism and because in my opinion the JSON-based inventory format is a simple, generic but very powerful data interface. Especially when considering the dynamic inventory feature of Ansible, one is completely free where and how to actually store the configuration data. There are already a number of Ansible bind roles available, however they mostly use a very simple approach when it’s about configuring the zone file and its serial. When generating zone files with an automation tool the trickiest part is the handling of the serial number, which has to be increased on every zone update. I’d like to explain what solutions I implemented to solve this challenge. One strength of Ansible is, that it can be run over and over again and only ever changes something in the system if the current state is not as desired. In my context this means, that the zone file only needs to be updated if the zone data from the inventory has changed. Therefore, also the serial number only ever has to be updated in that case. But how to know if the data has changed? I didn’t explain yet, how gdnsd__fact_zone_serial is defined. Initially, I simply had ansible_date_time.epoch, which corresponds the Unix time, assigned to the serial. This is the simplest way to make sure the serial is numerical and each zone update results in an increased value. However, in the introduction I also mentioned the issue of distributing the zone files between a set of DNS servers. Obviously, if they have the same zone data, they must also have the same serial. The example code listed above is a simplified version of my real code. If you are interested in the entire role, have a look at github.com: ganto/ansible-gdnsd. I hope this could give you some useful examples for using some of the more advanced Ansible features in a real-world scenario. Most of my readers must have heard about the “Let’s encrypt” public certificate authority (CA) by now. For those who haven’t: About two years ago, the Internet Security Research Group (ISRG), a public benefit group, supported by the Electronic Frontier Foundation (EFF), the Mozilla Foundation, Cisco, Akamai, the Linux Foundation and many more started the challenge to create a fully trusted public key infrastructure which can be used for free by everyone. Until then, the big commercial certificate authorities such as Comodo, Symantec, GlobalSign or GoDaddy dominated the market of SSL certificates which prevented a wide use of trusted encryption. The major goal of the ISRG is to increase the use of HTTPS for Web sites from then less than 40 percent two years ago to a 100 percent. One step to achieve this, is by providing certificates to everyone for free and the other step, to do this in a fully automated way. For this reason a new protocol called Advanced Certificate Management Environment (ACME) was designed and implemented. Going forward to today: The “Let’s encrypt” CA issued already more than five million certificates and the use of HTTPS is increasing to around 45 percent in June 2016.
acme-tiny is a small Python script which can be used to submit the certificate request to the “Let’s encrypt” CA. If you’re eligible to request a certificate for this domain you instantly get the certificate back. As such a certificate is only valid for 90 days and the renewal process doesn’t need any user interaction it’s a perfect opportunity for a fully automated setup. Make sure the involved service configurations load the certificate and key from the correct location (see ganto.acme_tiny: Service Configuration). If you became curious and want to have a setup like this yourself, checkout the extensive documentation about the Ansible role at Read the Docs: ganto.acme_tiny. The code “project” is hosted and managed on Github. Every release and pull request is tested via the Travis-CI continuous integration platform. It makes use of the rolespec Ansible role testing framework for which a small test suite has been written. Ansible Galaxy is used as a repository for software distribution. The documentation is written in a pimped version of Markdown, rendered via Sphinx and hosted on Read the Docs from where it can be accessed and downloaded in various formats. I recently had the task to setup and test a new Linux Internet gateway host as a replacement to an existing router. The setup is classical with some individual ports such as HTTP being forwarded with DNAT to some backend systems. The new router, from now on I will call it router #2, should be tested and put into operation without downtime. Obviously this means that I had to run the two routers in parallel for a while. The backend systems however, only know one default gateway. Accessing a service through a forwarded port on router #2 resulted in a timeout, as the backend system sent the replies to the wrong gateway where they were dropped. Fortunately iptables and iproute2 came to my rescue. They enable you to implement policy routing on Linux. This means that the routing decision is not (only) made based on the destination address of a packet as in regular routing, but additional rules are evaluated. In my case: Every connection opened through router #2 has to be replied via router #2. Using iptables/iproute2 for this task this means: Incoming packets with the source MAC address from router #2 are marked with help of the iptables ‘mark’ extension. The iptables ‘connmark’ extension will then help to associate outgoing packets to the previously marked connection. Based on the mark of the outgoing packet a custom routing policy will set the default gateway to router #2. Easy, eh? Now I’ll show some commands how this can be accomplished. The following commands assume that the iptables rule set is still empty and are for demonstration purpose only. Likely they have to be adjusted slightly in a real configuration. This means that IP packets with the mark ‘2’ will be routed according to the table ‘router2’. Afterwards I had to make sure that the involved connections coming from router #2 are marked appropriately (above the mark ‘2’ was used). The ‘mangle’ table is a part of the Linux iptables packet filter and meant for modifying network packets. This is the place where the packet markings will be set. Of course additional (or less) extensions can be used to filter the packets according to individual requirements. SuperMicro server mainboards often include a dedicated Baseband Management Controller (BMC) which offers out-of-band management of the server system. This is a dedicated embedded chip (Specifications) which allow to power cycle the machine, monitor hardware variables, update firmware, access the operating system console and much more. If you are used to big brand server systems, then you might be more familiar with the term iLO, which is the HP Integrated Lights-Out, or IMM, which is the IBM Integrated Management Module. The basic functionality is always comparable. A nice fact is, that most of these out-of-band management solutions support the Intelligent Platform Management Interface (IPMI) specification, which defines an interface for accessing the various functionalities from an operating system (OS) or the network (e.g. for monitoring or OS recovery). For Linux there exists GNU FreeIPMI which is a collection of powerful tools for accessing IPMI-compatible BMCs. It is available via default package manager on all major Linux distributions. There was an IPMI 2.0 compatible chip found, so we are good to go. # appropriate "IP_Address", "MAC_Address", "Subnet_Mask", etc. for the machine. However, this is an exception and most other key/value pairs can be changed concurrently. See the ipmi-config(8) man-page for more details. A neat feature of a BMC is the ability to remotely access the Linux console even when the regular network connection to the server is not working any more. However, this needs some additional configuration in the operating system. By default you won’t have access to the Linux system yet, so reboot the system via SSH so the BIOS can be setup accordingly. Unfortunately, the IPMI console won’t show the system’s POST output, so you have to keep pressing the DEL button in the terminal with the open IPMI console until you see the BIOS main screen. Then go to Advanced -> Serial Port Console Redirection and make sure, the SOL Console Redirection is enabled. Also remember how many additional serial ports you have available for configuration in this menu. This will become important when selecting the correct console in the Linux configuration. E.g. my board only has one other serial port (COM1) available and for this one console redirection one mustn’t be enabled for SoL to work correctly. If you want to see more verbose POST output, also disable Quiet Boot in the Advanced -> Boot Feature menu. Leave the BIOS by pressing Save Changes and Reset. After a short while you should be greeted by the Grub menu. However, there won’t be any more output, as Linux doesn’t know yet, where to connect to the SoL console. To exit the IPMI console, you have to press &..
GRUB_CMDLINE_LINUX="rd.lvm.lv=vg00/swap rd.lvm.lv=vg00/slash rhgb quiet console=tty0 console=ttyS1,115200n8"
Important: This has to be /dev/ttyS1 in case the BIOS knows only knows one additional serial port (which would correspond to /dev/ttyS0). If you have two additional serial ports in the BIOS (COM1/COM2), you must set /dev/ttyS2 here. Don’t configure Grub 2 to output itself to the serial console, as this is still handled by the default SoL configuration forwarding the initial system output. There are many other things that you can do via IPMI. Also there are other tools which can access IPMI-enabled BMCs. Another famous one is ipmitool. You might want to checkout Adam Sweet’s wiki on IPMI on Linux for more details how to use ipmitool. Personally, I prefer FreeIPMI for being a GNU project, being very intuitive to use and so far it worked perfectly well for everything I needed. If you have some hints or additions, please leave a comment below. Thanks for reading. Today I just found out, how super easy it is to setup a safe HTTP authentication via Kerberos with help of FreeIPA. Having the experience of managing a manually engineered MIT Kerberos/OpenLDAP/EasyRSA infrastructure, I’m once again blown away by the simplicity and usability of FreeIPA. I’ll describe with only a few commands which can be run within less than 10 minutes how it’s possible to setup a fully featured Kerberos-authenticated Web server configuration. Prerequisite is a FreeIPA server (a simple guide for installation can be found for example here) and a RedHat-based Web server host (RHEL, CentOS, Fedora). This will create a 3072 bit server key, generate a certificate request, send it to the FreeIPA Dogtag CA, sign it and install the resulting PEM certificate on the Web server host. SSLCipherSuite "EECDH+ECDSA+AESGCM EECDH+aRSA+AESGCM EECDH+ECDSA+SHA384 EECDH+ECDSA+SHA256 EECDH+aRSA+SHA384 EECDH+aRSA+SHA256 EECDH EDH+aRSA !aNULL !eNULL !LOW !3DES !MD5 !EXP !PSK !SRP !DSS !RC4"
That’s it! After restarting the Web server you can login on https://webserver.example.com with your IPA accounts. If you don’t already have a valid Kerberos ticket in the Web client, KrbMethodNegotiate On enables interactive password authentication.